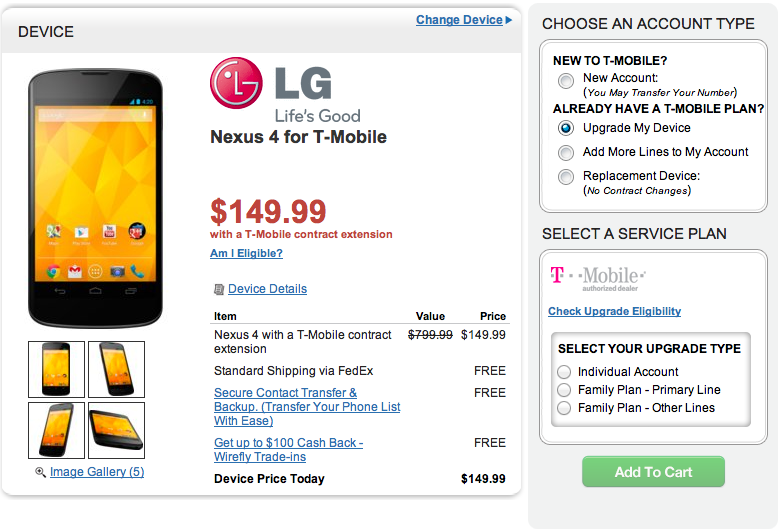 Eat your heart out Best Buy as Wirefly.com is offering the Nexus 4 for just $149 with a two-year agreement. That unbelievably awesome price is good for both new and qualifying upgrade customers. You’ll be hard pressed to find a better price on this device and we’re told quantities are very limited. In other words, act fast, like so fast you should have already hit the link at the end of this post fast. The price should make this obvious but this is for the Classic plan only. T-mobile should have nixed classic plans the same day they introduced the more lax migration to value rules. can’t move forward if the old options are still there for people to choose. No incentive to move to a value plan if they are going to lock you into a new two year agreement where you get nothing out of it but a savings of $20 per month. I’m waiting to cancel my plan, pay the 200$ cancel fee and get the $30/mo prepaid plan. Then buy each phone from the Play Store with the buckets of money I save from. Thank you lord for making me one who hates to talk on the phone. It says Nexus 4 is valued $799 come on Wirefly. So, is this a good deal? I am currently on an Even More Plus plan. I want to upgrade 2 devices and have a total of 4 lines. $149.99 plus 20/$20 payments totaling $549.99. Your math is what contributes to the confusion of the Value plans. Regardless, it’s still a better deal than effectively paying $630 with a Classic plan on the linked deal, although both of the two are inferior deals to the Play Store’s $350 price. Agreed; however, the OP’s statement is incorrect which is why I responded. $149 + $480 extra from Classic plan ($20/mo * 24 mo) == $629. Same phone at the Play Store: $350. How is this supposed to be a great deal again? Well, that was certainly an insightful and well-thought-out rebuttal. 1. if it was classic plan there’s no $20/mo. 3. the retail price of the Nexus 4 on t-mobile is $550. LG set the MSRP to â‚¬599 or $800. it’s just that Google subsidizes their phones on Google Play. so yes, this is a great deal – outside the Play Store. and 4. dave was right. this same old question was already answered too many times and there are still idiots who can’t understand how nexus pricing works. 1. If it were the Classic plan, which it appears to be, there WOULD BE $20 extra per month, BECAUSE THE CLASSIC PLANS COST $20 MORE PER MONTH. 2. If it were the Value plan, the price they quote you is the full price of the phone, not the down payment. The whole point of the Value Plans is to more honestly represent the price of the phone. This is quite certainly not the value plan. 3. The price on the Google Play store is $350, and that’s the full price. As for Google subsidizing it, so what? The reason *why* it’s hundreds of dollars cheaper is immaterial; the fact is that IT’S HUNDREDS OF DOLLARS CHEAPER. From a consumer’s perspective, buying this phone for almost twice as much as what you could get it for elsewhere makes very little financial sense. And as for 4, I certainly won’t disagree with you there. It’s quite evident that there ARE idiots who don’t understand how this works. 1. no. classic plan don’t cost $20 more. they are simply priced higher as classic plans are subsidized by the carrier and they’re charging more to get back what they subsidized over the course of 2 years. 2. value plan IS the full price of your phone. you pay an upfront cost then you pay $20 for 20 months on top of your plan for the total retail price over the course of 20 months and have the actual plan price for the last 4 months of your contract. you can also pay full price at once and get away from the $20/20 months. 3. that’s not the full price. you can check all retail price of any other sites. it’s all well above Play Store. did you ever wonder why was GNex $350 but it’s $200/150+contract on VZW or Sprint? or the Nexus S? it’s basically the same thing. play store subsidizes it to promote Google Play. 1. Classic plan doesn’t cost $20 more, they’re simply priced higher? WTF? I honestly have no idea what point you’re trying to make there. The unlimited Value plan is $69.99, and the unlimited Classic plan is $89.99. That’s $20 more, dude. 2. Ja, the price on the Value plan is the full price of the phone. Could’ve sworn I just said that. And yes, I know how the Value plan works. What you’re referring to isn’t necessarily the Value Plan per se, but the EIP. If you elect to buy a phone on EIP, you pay $20 more for 20 months, after which you pay $0 more, as opposed to the Classic plan where you pay $20 more forever. However, you don’t *have* to get an EIP to get a Value Plan (I, for instance, am not on one). If you buy the phone full price on the Play Store, by which I mean you buy it outright without it being subsidized by a Classic plan, you aren’t on the EIP, so you pay $0 more. So to compare the Play Store price vs. the Classic price, you have to factor in the $20 extra you pay for the Classic plan, times 24 months; a total of $480 extra. As Bill Clinton would say, it’s arithmetic. 3. Or what? That’s it? You can check all retail price or here’s a million dollars? You can check all retail price or here’s your own spaceship? Like I said, whether it’s the retail price or not is immaterial. $350 is the price you can get it for, and easily the best deal currently available for that particular phone. Given that, from a consumer’s point of view, *who cares* whether Google is taking a loss on it or not, *who cares* what its retail price is elsewhere, and *who cares* what Google’s reasons are for pricing it that way? Are people expected to pay 2x for political reasons, or what? Such scintillating repartÃ©e! I have clearly met my match here. If you look a the image, you have the option of upgrading your device. That means you extend your existing contract if you are eligible for an upgrade. You only change your contract if you want to. online stores like Wirefly,Target,Sam clubs,etc. When Tmobile finally ends classic plans? People that have classic plans,what happens with us?